By Rajini Sureka -Youth Co-ordinator, YWCA of Sri Lanka. 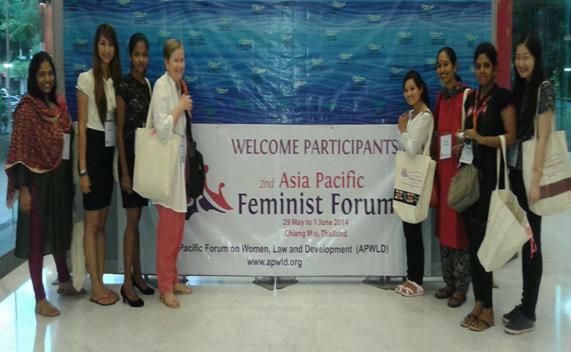 2nd Asia Pacific Feminist forum officially opened on the 29th of May, 2014 at the Empress Hotel Convention Center Chiang Mai, Thailand. The World YWCA is participating in this forum with a delegation of eight women from World YWCA India Myanmar, Sri Lanka, Nepal, Thailand and Bangladesh. This forum brought almost 300 feminists from across the five subs – regions of Asia and the Pacific (Southeast Asia, South Asia, East Asia, Central Asia and the Pacific) as well as global allies. Gathered around you are activists, lawyers, academics and women human rights defenders working on the multiple struggles of women in our region. We are beautiful and strong the moderator told us! During this programme we have eight YWCA representatives from different countries. At this forum we will meet women on the front line of women’s right activism, land right activism, migrant workers, Indigenous women, rural women leaders, democracy activists, labour movements leaders, women who have been imprisoned, harassed and intimidated yet remain determined to pursue our collective struggle for justice, right and equality. Deepen solidarity, alliances and foster movement building amongst women’s right advocates and allies regionally and globally. Even on the first day I felt extremely inspired and prepared to go back my country and to use everything that I have learnt here at the 2nd Asia Pacific Feminist forum. At this meeting our main focus has been to build networks with other organisations and sharing HER future: The Future Young Women Want. I am looking forward to work with my amazing group during this forum. Dviya asked the question in the opening plenary ‘how do we as a women’s movement call on our governments to account for non action on implementing women’s human rigths’. As a group of YWCA mobilized young women we are ready to talk, listen and contribute.